This is absolutely beautiful Susan! Absolutely LOVE this, Susan! Great job on the bird and I think I”m going to have to add that Nestie to my wish list 😉 Great card. Really beautiful, Susan. Love the birdie peeking out on the inside. This is gorgeous Susan!! WOW!! I love your frame, and that bird is just stunning!! Stunning card, Susan! 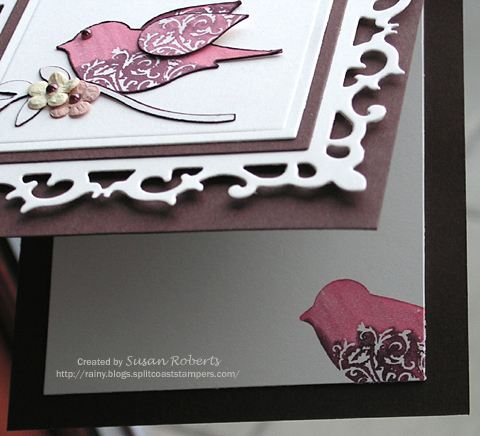 Love how you colored the bird and that white frame really pops on the chocolate paper – really striking! Hope you had a nice bike ride! We will be in Seattle this summer, so I hope it will be sunny then too!! Wonderful card! Love, love your idea with outline around the branch! Really like how you added color to the bird! So creative! Beautiful design! The bird inside is perfect! 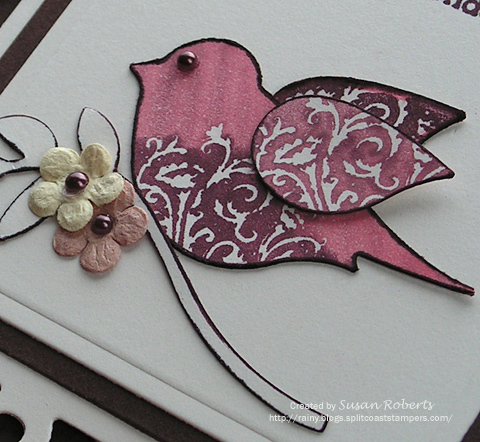 This is a lovely card, Susan, the two tone colouring of the bird with the little lacy detail is so effective. This is beautiful. Gorgeous border! Love what you did with the bird punch. Lovely card, Susan! And what a great idea to mix the colors when you didn’t have the challenge color. I like the shaded effect that gives on the image! And it’s beautifully framed by that die cut! Glad to see you back, Susan! Love that pop of color against the gorgeous frame and dark bg. Thanks for the blog visit!…enjoy those bikes..we’re waiting for a basket for our puppy so he can go on the bike too! I LOVE the BB and white here Susan. It is beautiful. What a great color combination. I don’t have any of these SU colors or I would case.. Welcome home and happy stamping. Hi Susan! so good to hear from you tonight! I always get excited to have you visit my blog!!! 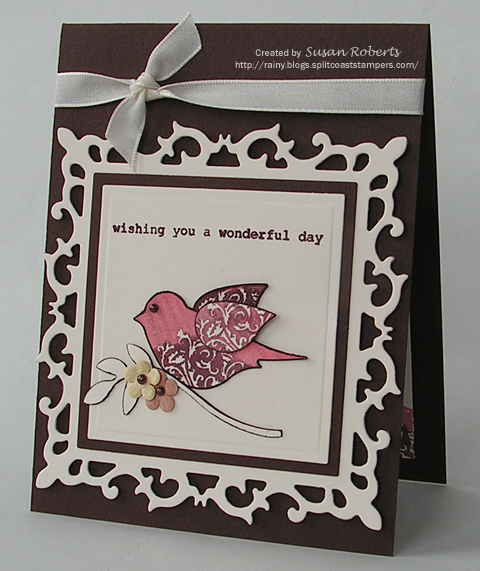 Lovely card..love the way the nestie fluer de lis ties in so pretty with the design on the birds..very eye catching! Classy… I love all the white and against the color it really stands out. Your birdie is colored so pretty, great job. What a sweet bird in lovely colors! I love how you colored this bird and branch! It gives a whole new life to this great punch! Your card is just gorgeous! Hi Susan: Thanks for the visit today — so nice to hear from you — I don’t get out from under my rock too often! I enjoyed my stroll through your blog here today — LOVE this card — so very pretty!!! Hope all is well — enjoyed your family pictures!!!! Just beautiful!!! Love that little bird!